Kettering Nomads booked their place in the quarter-finals of the NFA Junior Cup with a 3-1 success at Daventry Town Reserves. Shaun Morris, Adam Langley and Mark Redding scored the goals to send the Northants Combination Premier Division high-flyers through to the last eight where they will host United Counties League Division One side Rushden & Higham United. Weldon United stormed into the last eight of the NFA Lower Junior Cup as they thrashed Silverstone 7-0. But Higham Town’s hopes were ended with goals from Rosko Cook and Callum Dench not being enough to prevent a 4-2 defeat at Eye United while Desborough & Rothwell United Reserves also went out as they were beaten 6-2 by Harpole Reserves. In the Northants Combination Premier Division, Wollaston Victoria claimed a 4-1 success at Corby Pegasus thanks to goals from Dan Burston, Tom Ripley, Sam Sturman and Joseph Wenham. Strugglers S&L Kingswood and Burton United shared a goalless draw while Earls Barton United went down 3-0 at home to leaders Woodford United. Desborough & Rothwell United also tasted defeat as they were beaten 3-2 at Spratton. Ruben Caiola hit a hat-trick as Woodford Wolves claimed their third win of the Division One season by edging out Bugbrooke A 5-4. Callum McDermott and Matt Watts added the other goals for Woodford. It was a bad day for Corby Strip Mills, however, as they were well beaten 6-0 at Moulton Spartak. Wollaston Victoria Reserves strengthened their place at the top of Division Two as they beat fellow high-flyers Yelvertoft 3-1. Steadman Whittaker was the hero for the leaders as he hit a hat-trick. That result allowed Corby White Hart Locos to move into second place on goal difference as goals from Grant Homer (2), Stephen Deegan and Anthony Underwood gave them a 4-0 victory at Kettering Nomads Reserves. Weldon United Reserves inflicted more misery on bottom side Kettering Orchard Park with a 10-1 success as Carl Cooper grabbed the consolation for the hosts. 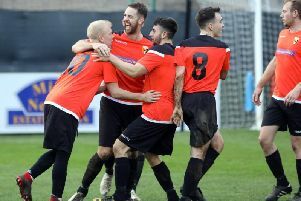 Corby Ravens maintained their unbeaten record at the top of Division Three with a 7-0 demolition of Weldon United A.
Adam Witkowski led the way with a hat-trick while Louis Trimble (2), Harry Campbell and Stephen Ennis added the others. Stanwick Rovers stayed in touch with the leaders as goals from Carl Brown, Kane Costello and Connor Gates secured a 3-1 win over Finedon Volta Reserves. Elsewhere, Thrapston Venturas edged out Irthlingborough Rangers 1-0 while Corby Siam were beaten 4-0 at Woodford United Reserves. 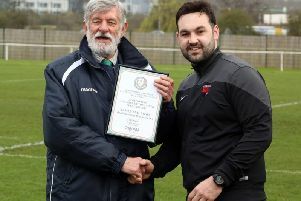 Visan Cretu was the star of the show as Corby Siam Reserves maintained top spot in Division Four. Cretu hit five of his team’s goals with Dumitru Stefanescu added the other two as they won 7-1 at Corby White Hart Locos Reserves.